Arlene Mejorado is a Los Angeles-raised documentarian and multi-media artist based in San Antonio. Her own experiences shape her storytelling practices and subject matter interests. As a first-generation “American” she is constantly exploring themes of diaspora, cultural hybridity, gender-queerness, and racial identities. Through the mediums of photography and documentary film, Mejorado experiments with the intersection of art and visual storytelling. Through street and gallery installations, she seeks to transform public space and engage her art with the social environment. She has worked on special digital media archival projects at the Human Rights Documentation Initiative, El Salvador’s Museo de la Palabra y la Imagen, Self Help Graphics & Art, and San Anto Cultural Arts. Her documentary film was featured in Germany’s 2015 Filminitiativ festival within the African Diaspora category. In 2016, Mejorado held her first solo exhibit curated by LadyBase Gallery at R Space in San Antonio. Mejorado received a degree in Latin American Studies from the University of Texas at Austin and is currently pursuing new academic and creative endeavors. DR: Hi Arlene, How are you? AM: I am well. Enjoying the nice fall season. I survived the summer heat and don’t miss it! DR: You are kind of an all around multi-media documentarian/artist. Tell me, how would you describe your approach to photography and art? AM: I document and try to stay true to my subjects. But I also believe that who I am and where I come from informs my work and helps me in my approach. My work reflects a chemistry of documentary photography, storytelling, and artistic expression. It was organic for me to intersect the three because my experiences have shaped my passion to document communities of color and working class people. Photography is a powerful medium to work with. I like to say I am “deeply superficial” in that I understand the power of the image and how visual content can pierce straight to our heart and soul. I take my photography sessions very seriously. My camera is my vehicle into worlds. My heart guides me on where to go and who to shoot. I think people sense that and this is why often people allow me in. Its about respect, dignity, and love. That exchange must be there. It will show in your work. DR: When you photograph on the streets of Mexico, Los Angeles or San Antonio what is your process like? Do you engage with any subjects? How does interaction affect your images? AM: I do a lot of portraiture and often interact with my subject but I also do candid photography. It is a mix of both and there is a reason for each approach. Interacting with people allows for a disarming exchange and a formation of trust. Sometimes this occurs within a 1 second of eye contact. Other times I sit and talk to someone I photograph for an hour. The circumstance is always slightly different. Candid photography is something I usually do when I don’t want to influence the situation in any way. Its the “fly on the wall” approach where I stand in a place where I am not noticed and let the situation unfold. Other times I stand right in the middle of a crowd and still go unnoticed which can be really great for good shots. I really enjoy portraits of strangers, especially full body. The series that I am working on requires interaction, conversation, some instruction, then I take the portrait. DR: You are working on a series titled Pulga Series where you have take photographs at flea markets. Recently, you were able to rent a unit inside San Antonio’s Poteet Flea Market and set up a photography studio; asking bystanders, shoppers and attendees to take portraits. What was that experience like? Did you receive any negative reactions? AM: I invited people to step into my unit for a photo. Often, I persuaded people by assuring them that I was not selling anything and there were no tricks. I offered them an invitation to the exhibit and took their information to send images to them. 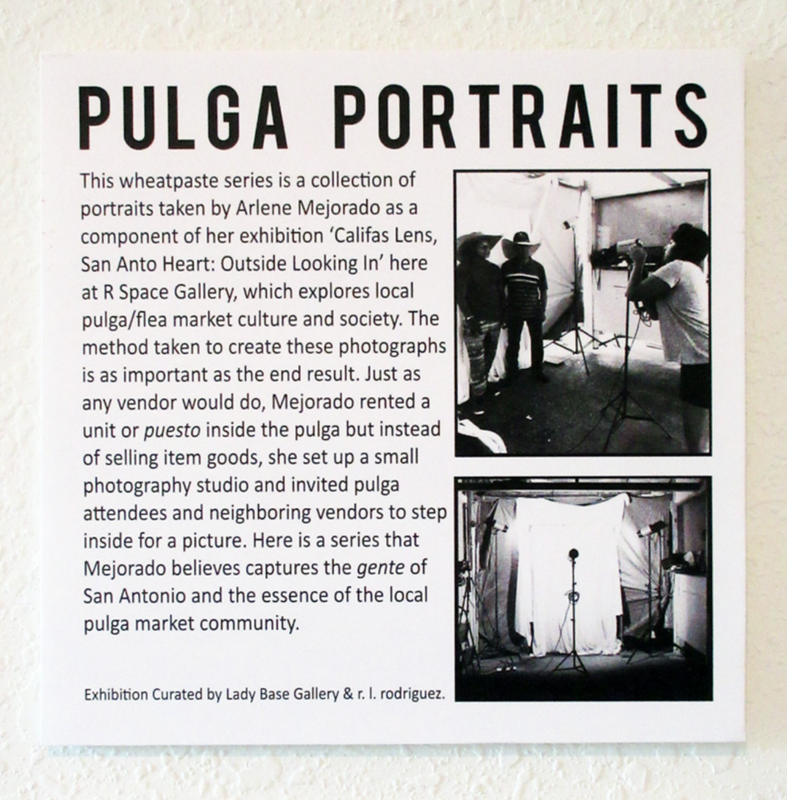 In the case of the pulga portraits, I would say about 40% of the people I asked said yes. When it comes to “negative” reactions, I get those all the time. I joke that I am use to rejection. People decline my requests for photos all the time. Sometimes a lot, and other times hardly. But I don’t get discouraged because if I start to feel insecure or down about it then my work suffers. People read your confidence and the more confident you are, the more likely the next person will say yes. Sometimes I take candid shots and people get upset. At that point, I talk to them. I explain what I do and why. I never release photos of people that let me know they do not what their photo taken. I don’t always know their reasons and I need to respect that. It can be a question of their safety so I need to be sensitive to that. DR: You have created several platforms to give voice to and showcase women of color. Could you speak about Mujeres en Medio and Optica Fotozine. AM: Mujeres en Medio is a website and digital platform that brings together women that want to publish - essays, articles, memoir stories, photo stories, DIY documentaries, and mixtape/playlists. It continues to take shape based on who contributes. I really welcome input and contribution by women that have something to say. We attract a lot of photographers and writers which has led to some great collaborations. Optica is the zine that branched from Mujeres en Medio. Being that we built a solid network of women-of-color photographers I wanted to really showcase that. I also wanted emerging women photographers to experience their images on magazine paper they could touch and smell. It’s a beautiful zine and we are preparing for the second edition right now. It should be out in the spring of 2017. DR: Do you have any projects or exhibitions in the works? AM: I am about to install a series of wheat paste murals for Luminaria Arts Festival here in San Antonio. My work will focus on the dispersal and displacement of the Black Neighborhood on the Eastside. I am focusing on people that have chosen to stay. I have several other projects coming up as well.